I am very sad about what happened in Japan last week. To send support to those who lost family, house, work, everything, I would like to raise money for charity from migh-T. I am making some special items for this. All sales from these items will go to Red Cross Japan Tsunami Appeal. ps. I will make these items available online too for those who can't attend the event. migh-T AW11 Collection "Hidden World" The Autumn Winter 2011 collection includes products such as luxury hand knitted cashmere jumpers, cardigans, silk dresses, cotton jersey dresses, over sized T-shirts, corduroy trousers, and knitted scarves. These products are manufactured in the UK to the highest standard. My very unique design and print work can be seen throughout. 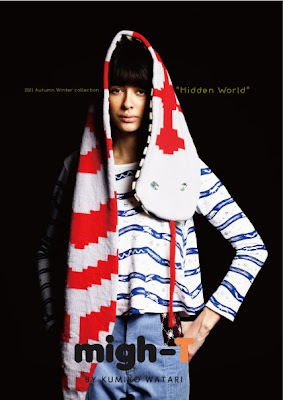 The theme for this collection is “Hidden World” in which I spotlight the animals and plants that live in hidden places and whose activities are not well known or visible to the human eye. The plants growing underground, animals living in burrows, secretly eating their vegetables and getting up to mischief.